Thinking about your own funeral is never an easy thing to do and if you've ever had to organise a funeral for somebody, you'll understand just how many decisions need to be made and how difficult it can be. That is why we have partnered with Dignity, the UK’s leading provider of pre-arranged funerals, to bring you the Prepaid Funeral Plan. Planning for your funeral now can help protect your loved ones from some of the burden of having to make all of the funeral arrangements. At the same time, it can provide them with help and support they will need during a difficult period. There are financial benefits too. A Prepaid Funeral Plan from Dignity lets you pay for your funeral at today's prices. It is a way of taking control, setting out your wishes in advance and fixing the costs. Once paid for, the services in the Plan are guaranteed to be covered, irrespective of when it is needed and how much costs may rise in the future. Acceptance is guaranteed for anyone aged 50 or over and you can take out the Prepaid Funeral Plan without answering any medical questions. What's more, the Plan is portable anywhere in the UK so if you move, the Plan moves with you without incurring any extra costs. Unlike some other Plans on the market, for a cremation funeral, Dignity guarantees to cover funeral director costs, and cremation costs in the plan. If a burial is required, the funeral director costs are guaranteed to be covered, but as the third party costs for burials vary so much across the UK these services can't be guaranteed in the same way as a cremation funeral. Instead, a financial contribution of £1,200 (increasing each year in line with RPI) will be made towards burial fees and any services provided by third parties (such as Minister's or Officiant's fees). You can also personalise your Plan as much, or as little, as you like by adding 'special requests'*, these can include things such as hymns and readings, favourite flowers, or a route for the funeral cortège to follow. The money you pay for your Plan is paid directly into the independent National Funeral Trust where it is securely held until it is needed. The money is only paid out to the Funeral Director once a funeral has taken place. And when the time comes, it is simple and straightforward to put the Plan into motion. With just one call to Dignity, everything will be taken care of by the Dignity Nominated Funeral Director and your loved ones will receive their full support and guidance. There is also a 24-hour telephone bereavement advice and counselling service on hand as well, if your loved ones need it. Dignity is regulated by the Funeral Planning Authority (FPA), the professional body that oversees the operations of registered funeral plan companies. It's an unavoidable truth that everyone will need a funeral, which will need to be paid for. But with so many ways of putting money aside for the future you are probably asking yourself 'why choose a Prepaid Funeral Plan?'. †Forecast based on average annual compound growth rate of 6.33% each year between 2007 and 2015. 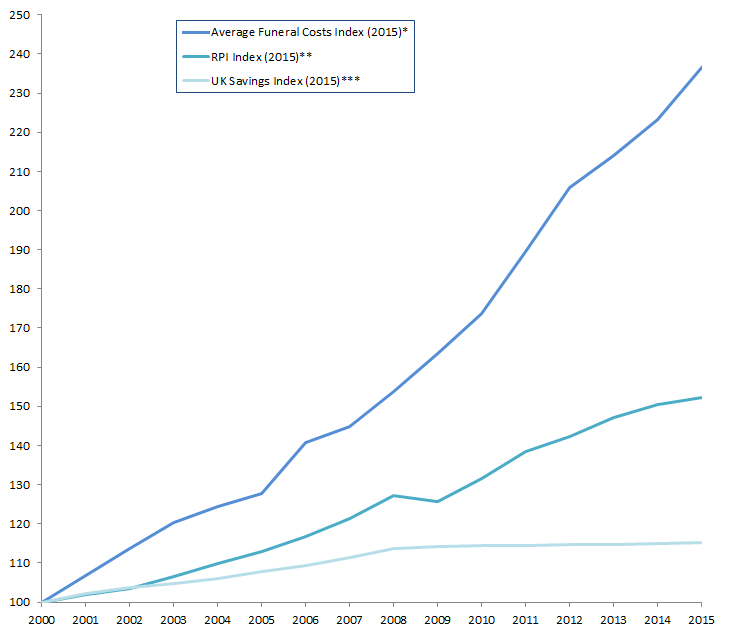 *2000 - 2006 (Mintel: Funerals - UK - January 2007) | 2007 - 2010 (calculated using average annual compounded increase of 6.33% per year) | 2011-2015 (Average Funeral Costs research carried out by Matter Communications). ** Office of National Statistics (ONS). *** Calculation and data Source - The Investment Research Partnership Copyright 2015, UK Savings £2,500 Net Source - Morningstar Copyright 2015. With a Prepaid Funeral Plan from Dignity, you do not need to worry about funeral costs rising in the future because you fix the cost of the services in the Plan at today's prices. You'll know exactly what you need to pay and have peace of mind that you won't need to pay a penny more for these services when the time comes. Over 50's life insurance policies and money you have in savings can't guarantee to cover funeral expenses in the same way. Low interest rates and changes to inflation mean that when the time comes, your family may be left with a shortfall. Furthermore, these do not include help with the funeral arrangements and so they would still have to do that themselves. This table shows how the Prepaid Funeral Plan compares to some of the other ways of taking care of funeral costs. There are three Plans for you to choose from, each one guarantees to cover the funeral director services, and the third party costs for a cremation, as included in the Plan. The table below outlines what each Prepaid Funeral Plan includes. The plans start from £29.68 per month (based on the Amber Plan paid over 15 years). For full pricing and payment options available you can ’request a call back’. Alternatively, give us a ring on 0800 033 4323 and one of our friendly UK based advisors will be happy to help. • Doctor's Fees. Changes to legislation in May 2015 mean there will no longer be a charge for doctor’s certification for cremations in Scotland. Similar legal changes are being considered for the rest of the UK, so the cost of these doctor’s fees have been removed from all of the Plans. If the funeral takes place outside of Scotland and before the legal changes are made throughout the UK, then, if applicable, the doctor’s fees must be paid by the next of kin or personal representative, when arranging the funeral. • Embalming, burial plot, memorial or headstone, flowers, catering/wake. • Repatriation from outside mainland Great Britain, Northern Ireland, Jersey, Isle of Man and Isle of Wight. • Costs for removing artificial limbs and mechanisms such as pacemakers. • This list is not exhaustive. For full terms and conditions, you can request your FREE information pack. *If a burial is required, the Cremation fee and Minister's or Officiant's fee are not covered by the guarantee. This is because burial costs vary widely across the country, so cannot be guaranteed in the same way as a cremation. Instead a contribution of £1,200 (rising with inflation) will be made towards burial fees and any services provided by third parties (such as Minister's or Officiant's fees). Additional special requests can be added to the Plan at any time. Some requests may incur an additional charge and may not be covered by the price guarantee. Such costs will have to be paid for at the time of the funeral. Alternatively, you can pay a contribution in advance for any additional requests with the amount paid being subject to RPI inflation. For generations, Dignity has helped families to plan funerals, providing support and care at an emotional time. Dignity launched the UK's first funeral plan in 1985 and since then, they have helped more than 698,000 people arrange their funeral in advance. They are one of the UK's leading funeral service providers with a network of over 1,190 owned or approved funeral directors nationwide. Their funeral directors carried out more than 73,500 funerals in 2015. The Plan is available to anyone aged 50 and over and you'll be guaranteed to be accepted. There are no upper age limits, no health restrictions and no medical questions to go through. Can I choose my own funeral director? Dignity have a network of over 1,190 owned or approved funeral directors within the UK. When you take out a Plan, Dignity will advise you of your nearest Nominated Funeral Director. All of the Plans are portable and can move with you anywhere in the UK without any charges. If you move home, simply contact Dignity and they can allocate your Plan to a new Nominated Funeral Director. Yes. As long as the person is aged 50 or over, you can buy a Plan for someone else. Do I have pay it all in one go? No, there are a range of ways to pay for your chosen Funeral Plan to suit you financially. You can choose to pay a one off lump sum or spread the cost of your Plan over an extended period of up to 15 years. If you choose to spread the cost over more than 12 months, an instalment fee will apply. (This charge is needed to ensure the money paid into the Trust Fund can increase in line with Inflation during the term of the Plan and means that we can still provide the guaranteed services in the Agreement, irrespective of when the funeral plan is required). The Plan guarantees to cover the services included only. This list can be found on 'Compare funeral plans' tab. Other costs such as flowers, headstone, or catering at the wake are not covered. Regulatory or law changes could also mean extra costs. These would have to be paid for at the time of the funeral by those arranging it. Alternatively, you can make an additional payment into your plan (which will increase each year in line with inflation) as a contribution towards these costs. The Plan gives you the freedom to personalise your Plan exactly how you would like it to be. From adding special requests* such as hymns and specific readings, to requesting your favourite flowers, it's all up to you. *Some special requests will need to be paid for at the time of the funeral or if you prefer, you can make a payment (rising each year in line with inflation) as a contribution towards these costs. What happens if I die before I have paid all of the monthly instalments? All of the arrangements and price guarantees in your plan can still remain in place as long as those arranging your funeral agree to pay the outstanding payments in full. What if I die abroad or away from home? If you pass away abroad, it is the responsibility of your Next of Kin to arrange repatriation. The cost of this is not covered by the Plan however this is usually covered by their travel insurance. If anything were to happen to Dignity in the future, your money is protected because all of it is paid directly into the National Funeral Trust which is independent of Dignity and no-one at Dignity can access it. In the unlikely event that Dignity were to go out of business, the Fund’s Trustees would appoint or create a new company to administer all the plans and ensure that all the funerals are performed.If anything were to happen to Dignity in the future, your money is protected because all of it is paid directly into the National Funeral Trust which is independent of Dignity and no-one at Dignity can access it. In the unlikely event that Dignity were to go out of business, the Fund’s Trustees would appoint or create a new company to administer all the plans and ensure that all the funerals are performed. All payments you make for your Prepaid Funeral Plan are placed in the National Funeral Trust which is completely independent of Dignity. The trust is professionally managed by some of the leading names within the financial industry to ensure that all of the guaranteed services in the plan can be paid for in the future. Once you have bought a plan, you have 28 days to change your mind. You will receive a full refund of any monies paid if you cancel within this time. If you choose to cancel after the 28 days, you will receive a refund minus a cancellation charge of £395.